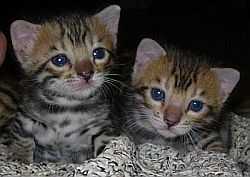 - These are pictures of the "type" and quality of kittens produced by Imaginique Bengals. - We have KITTENS. BEAUTIFUL, AFFECTIONATE KITTENS AVAILABLE RIGHT NOW. Please call us to discuss availability and pricing.-Check out the kitten page for pictures of available kittens. --Welcome to IMAGINIQUE, breeders of Bengal kittens with the Asian Leopard Cat heritage.- All of our cats are hand-raised, are sold with a contract, and come with a health warranty.- We are members of TIBCS, TICA, and ACFA.- We breed beautiful cats with rosetting, clear coats, bright coloring, sharp contrast, loving personalities, and overall good type. 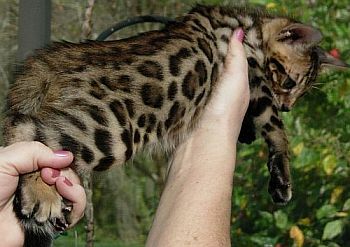 We always strive to maintain the overall beauty and purity of the Asian Leopard Cat. So, if you are looking for a beautiful and loving kitten as a companion and pet for the home, you have come to the right place. ---Although the domesticated Bengal Cat has beautiful physical features, it is their great personalities that make them so enjoyable and such "good natured" pets.- They are intelligent, playful, curious, can learn tricks easily, are very athletic, and adapt easily to other animals (including birds).- In some respects, at least in our opinion, their behavior is more dog-like in character.- Many of them like heights, an arboreal trait observed in some Asian Leopard Cat subspecies, and they will often seek a high-place to observe your movements and daily household chores.- Following you around, seeking your constant attention is not uncommon, and since they like water, don't be surprised if they try to get in the shower with you.- From the standpoint of their physical appearance, their rosetted and glittered coats, which are short, tightly pelted, and smooth (like silk), are unique.- More importantly, they are easy to care for, enjoy being with children, and their dietary and medical needs are the same as other domestic cats.- Quite simply, this amazing animal will keep you entertained for a lifetime. 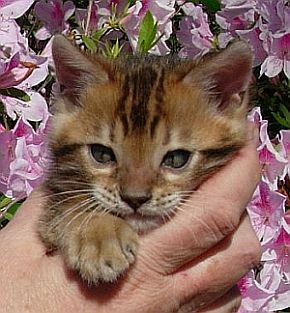 ---Bengal kittens are available throughout the year .- Additionally, we have RETIRED CATS from time to time. So, feel free to contact us for pricing, availability, and your personal preferences (see our contact page, or call us at 813-949-5590). 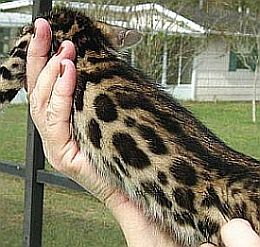 If you seek more knowledge and facts regarding the Asian Leopard Cat and its hybrid cousin, the Domestic Bengal Cat, just follow the aforementioned links or use the MENU (above, left-center); you will find a lot of interesting and useful information in our articles. For contract and shipping data follow the link to our policies page. ENJOY! 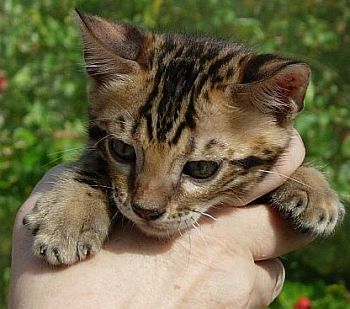 This web site designed by Imaginique Bengal Cats, Inc.
To obtain specific information on our cats, -call: 813-949-5590 .